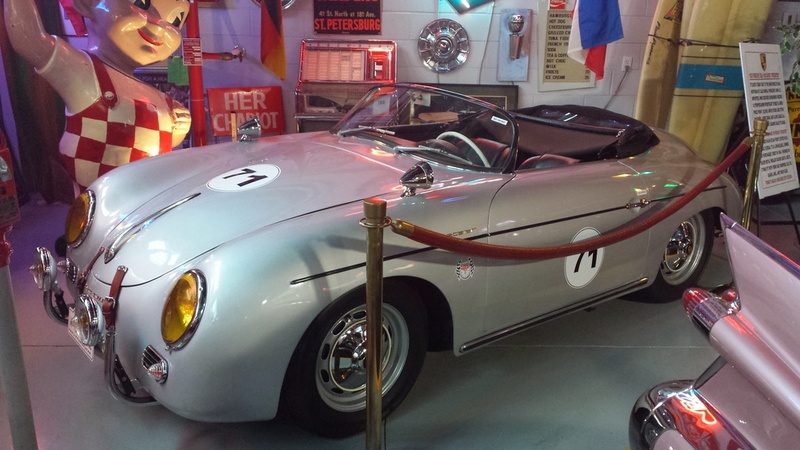 The Mount Dora Museum of Speed is located in central Florida in one of the few areas of the state with hills (read minor undulations), and turns (read minor changes in direction). It reminded me of the Volo Museum (see Visiting Volo) in that the main cars had a story, and are presented in a setting complete with memorabilia. It also compares with Volo in one other respect; most of the cars are for sale. In that sense, it is a classic car dealership as well as a museum. On a rainy weekday, I had the place to myself, and got to chat a bit with the owner, Kerry Bogard. It packs a lot of content into a small space. Just about every inch not taken up by a car is covered in Memorabilia. manakins are around many of the cars in period garb. Neon signs, tin signs, and posters adorn the walls. One unusual decorations are the many midget racing cars that are hanging from the ceiling. You might miss them if you are not paying attention, but there are quite a few. If there is a theme to the cars present, I could not figure it out. American hot rods seemed like a good candidate given the cobra and the Corvette, and the Rat Rod pickup. Speed might have been a candidate with the corvettes and Indy pace cars. But then, there was the vintage Hearse, the 356 Speedster, the 911, the Jag, the 1980s Mercedes, the restored pickup, etc. Museum of Speed seems only partially accurate given the contents during my visit.